Looking for a mild homebody to spend the cold nights with? 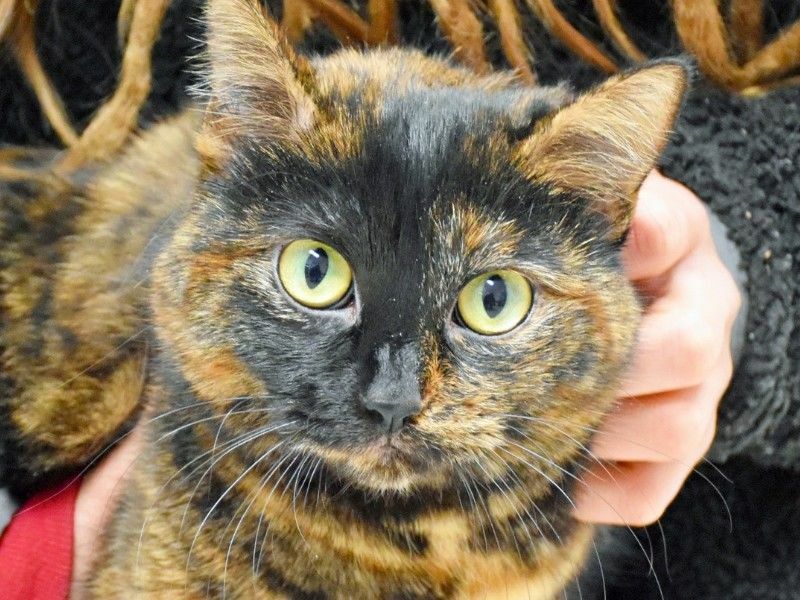 Harley is a two-year-old female tortoiseshell shorthair who is looking for a cozy, quiet spot to call home. She has light green eyes and is front-paw declawed. Harley does take a little bit of time and patience to let her warm up to new friends, but once she does her personality comes out to shine. She likes to play with balls, toys and lights; the exercise would do her a bit of good because right now she's a chunky nine pounds on a seven or eight-pound frame. Harley also likes to snuggle and talk with her person, and once she claims you, you are in for life. She would be best as an only kitty in a quiet environment. If you like quiet evenings at home, Harley would be the perfect companion for you. As we gather with our families for the Thanksgiving meal, let's not forget to watch out for a few things to keep all our family members happy and healthy. Overindulging in rare foods can lead to tummy upset, and it is hard to be in a thankful mood while cleaning up messes on the floor. Make sure your pets cannot get into poultry bones, yeast dough or other foodstuffs that can harm them. Decorations sometimes are appealing to look at; however, make sure your pet does not find them too irresistible. And watch to make sure as friends are coming in that other friends are not getting out. Just a few small ideas to help it be a safer day for the entire family. HSBC is taking part in #GivingTuesday. If you are not into Twitter, Instagram, or Snapchat, there is another way you can raise funds for the shelter. Did you know that a Facebook fundraiser can raise money for your favorite charity regardless of where your friends live? And that the entire amount of any donation is deposited into your charity's account? On the left side of your Facebook screen, scroll down to the Explore category (you may need to click "see more" click Fundraiser, then Raise Money and follow the prompts. Thanks, from the residents at HSBC!